From 28 November to 23 December do shopping at Kontinent Shopping Mall on Bukharestskaya and new trade space “Kitay-gorod 2”, participate in the instant prize draw and get a chance to win new iPhone X! iPhone X draw will be held 23 December at the show of Tatyana Bulanova! “Kitay-gorod 2” was opened in the south of Saint Petersburg in Kontinent Shopping Mall on Bukharestskaya. New center was the continuation of the successful project “Kitay-gorod” opened in September 2016 on Vyborgskoye shosse. There are no network stores that are familiar to everybody, in the trading zone there are manufacturers and suppliers of goods from China offering goods directly from factories. Visitors will enjoy an entertaining program, master-classes, photo studio and face painting, gifts, discounts in shops and draw of valuable prizes! The program begins at 15 p.m. Free of charge. Incredible discounts in stores, show program, draw of prizes and gifts. Special guest of the holiday - band “Russkiy Razmer”! The program will begin at 3 p.m., admission is free! In November, SATURDAYS and SUNDAYS of great discounts will be held in shopping malls of “Adamant” company These days visitors of shopping mall will enjoy holiday programs, shows of pop stars, prizes and gifts, as well as great discounts in stores! All guests of the holiday will meet heroes of favorite cartoons and tales, master-classes, attractions, photo zone, face painting and many other interesting entertainments, draw of valuable prizes and gifts. Throughout the day, special discounts and promos will wait for you in stores of Zanevsky Kaskad Shopping Mall! 28 October Mezhdunarodny Shopping Mall celebrates its birthday – 5 years! Visitors will enjoy an exciting show program, discounts and draws of valuable prizes, shopping auction, draw of prizes, as well as free show of inimitable Igor Kornelyuk! Celebration begins at 3 p.m.! Big show program, gifts and contests will wait for visitors. HYPE - more than 30 new fashion stores! The program will begin at 15:00 p.m., admission is free! Adamant Managing Company takes part in “RENT 2017”, Forum of Commercial Real Estate and Retail, which will take place 25-26 October in DI Telegraph (Moscow). Two-day event will bring together the best industry experts from all regions of Russia at one site to exchange professional experience and knowledge. October 19th , 2017th Adamant holding is celebrating its anniversary. Adamant holding was founded in Saint Petersburg in 1992. Today it’s one of the leading multidisciplinary companies located in the North-West of Russia. All the October special discounts of up to 50% on furniture and household goods are available in Furniture Center “12 Stulyev”! Prices are so weightless that furniture flies right before our eyes! Have a chance to buy! On behalf of many thousands collective we are happy to congratulate you on your Birthday! This year Adamant Holding you are heading celebrates the 25th anniversary of its foundation. Today Adamant is one of the most successful leaders of Russian business, and it became possible, first of all, thanks to your invaluable experience, professionalism, personal participation and dedication to your labor of love! We wish you good health, happiness and family well-being, good luck, loyal friends and reliable partners! 30 September real HOLIDAY OF DISCOUNTS is waiting for visitors of Balkania Nova Shopping Mall and Balkansky Shopping Mall! Bright show program, amazing photozone, performances by actors and music bands, master-classes for children, draws of prizes and shopping auctions. And naturally, discounts in stores! Special guest of the holiday - inimitable Tatyana Bulanova! In September Kontinent Shopping Malls prepared many joyful and interesting events for buyers. 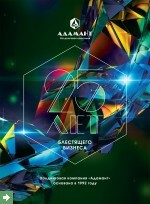 On 23 and 30 September, Kontinents invite to grandiose celebration of Birthdays and concerts of stars! These days discounts and special offers will be available in the stores of shopping malls, as well as cheerful entertainment program will not leave anyone indifferent! Programs start at 3 p.m. The entrance is free of charge. Guests of holiday will enjoy entertainment program, interactive venues, animation and show of actors, and the main guest of the evening will be the popular Marsel band with amazing performance! In the cheerful atmosphere of tumultuous holiday, the guests of the event will get acquainted with sport life of Frunzensky district. In the program of the exhibition: bright presentations of sports, performances of the best pupils of sports sections, entertaining and competitive program with draw of valuable prizes. Besides that, different master-classes, interactive activities, plays and many other things are waiting for tenants of Frunzensky district! Happy Day of Knowledge to all school students from Adamant Management Company. On September 1, after the school gathering we invite you to join us at our malls and celebrate. There are many events to choose from and a lot of gifts! Make your first day of school unforgettable with your favorite characters, attractions and competitions! From 15 August to 15 September 2017, each buyer of Mezhdunarodny Shopping Mall may take a chance and win valuable prizes. Buy RUB 500+ worth of products in Mezhdunarodny Shopping Mall, register your receipt at the registration stand near the entrance to the shopping center, and claim your prize! Everyone wins! To participate in promo, checks are accepted for purchases made from 15 August to 15 September 2017 in stores of Mezhdunarodny Shopping Mall for the amount from 500 rubles. Your hard work is of tremendous importance for the wellbeing of our city! Let every building created with your skillful hands stand for many centuries and make people happy with its beauty and durability. Let us wish you professional success, reliable partners, financial stability, good health, happiness and all the best in your families! Centers of sport stores “ActiveSport” will take part in annual Festival “VKontakte”, which will take place in Saint Petersburg on 15-16 July. On the “ActiveSport” venue, everyone can participate in exciting competitions and win valuable prizes, as well as receive special discounts and offers from stores.